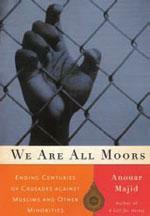 By Anouar Majid, University of Minnesota Press, 2012, paperback, 228 pp. One does not have to dig far into today's headlines to find examples of Islamophobia that contradicts the vision of a pluralistic and tolerant United States. According to Anouar Majid, professor of English at the University of New England in Maine, however, the "othering" of Muslims has a very long history, stretching back several centuries to the foundation of European Christendom. In We Are All Moors, Majid reveals that European identity was fashioned in part as a way to unite competing Christian groups against the Moorish presence in Spain. From the expulsion of the Muslim kingdoms from the Iberian Peninsula came the concept of limpieza de sangre (cleanliness of blood) or racial purity, in which Christians denied centuries years of shared history and intermarriage with the Moors. Europeanness became a symbol of purity in contrast to the contamination of the "other," at first embodied by Muslims and Jews, but later applied to what Majid describes as "New World Moors," Native Americans, African slaves and, more recently, Mexican migrants. Majid compellingly argues that these medieval animosities still exist today, constituting a hierarchy of racial disassociation that stifles social harmony and economic stability, and continues to result in thousands of needless deaths. His book skillfully illustrates how the appeal to "pure" racial categories has distorted the fact that we are all members of some sort of minority group, in a time where no one is truly a native and majorities are fractured into many identity groups.